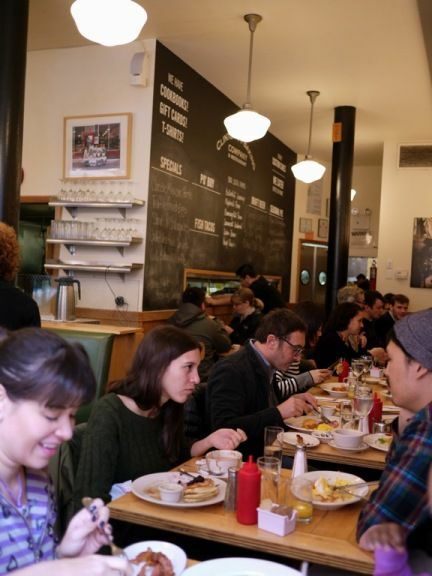 Clinton Street Bakery serves the BEST Breakfast in New York City. There I said it. 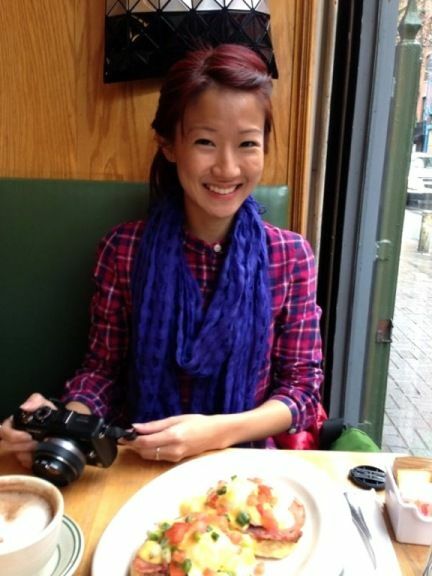 Even though i haven't tried all the breakfast places in NYC but it about tops all the breakfasts that i have had in my entire life. That's gotta be something considering i do Breakfast-Breakfast-Breakfast-Breakfast-Breakfast for my meals. And NYC agrees with me, because practically everyone in the city was there queuing to get a table at this coveted bakery/cafe/bistro/restaurant. Despite our best efforts to get there early, the starving and jet-lagged us (mainly S) were told the wait was 2-3 hours. Desperation called for some random breakfast around the corner (which turned out to be decent), just so we could have a taste of the best blueberry pancakes in NYC (crowned by New York Magazine twice) and more. The wait and additional calories consumed prior were all worth it when i took that first bite into my Eggs Benedict (US$15). 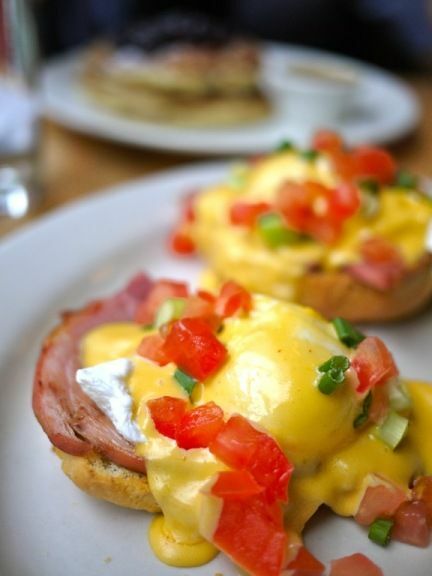 Perfectly poached cafe free organic eggs sat on top the maple cured ham and the signature toasted buttermilk biscuit and given a generous pour over of a creamy, cheesy and full bodied hollandaise sauce. This is THE orgasmic combination and i think we should only do Eggs Ben on Biscuits from now on. It isn't the most traditional Eggs Benny but who cares? Clinton Street Bakery is part Jewish deli, some Mexican stop and the rest American take out, but the best qualities of them mixed together, as said by owner/chef Neil Kleinberg. It's that kind of hearty food that comforts and warms the tummy when one is exhausted and starved, just as we were that morning. 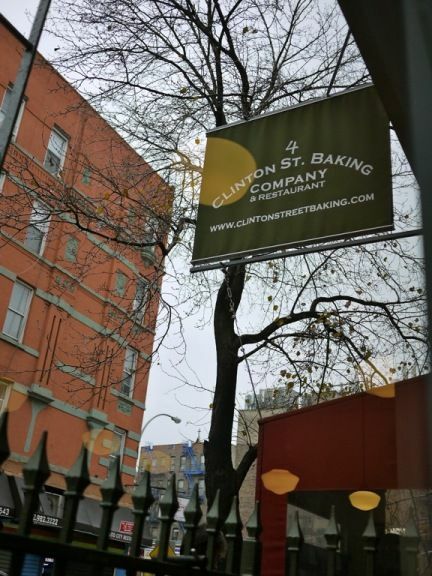 Great ingredients maketh a good meal and Clinton Street Bakery sources their products from organic and quality farms so that means cage free eggs and chickens, seasonal and local produce, as well as prime quality meats and high grade maple syrup. Their Award winning pancakes also had Martha Steward singing their praises. 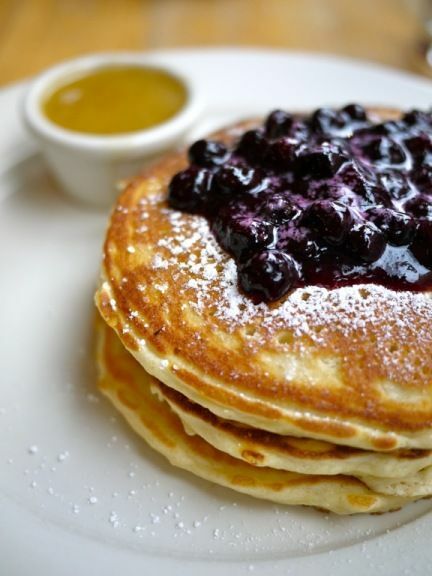 Their Wild Maine Blueberry with warm maple butter ($14) are so recognizable i could identify it anywhere. Texture-wise, it's like biting into a slightly salted and buttery cloud dusted with snowy icing. And that warm maple butter is simply divine. This is an excellence case of the whole is greater than the sum of its parts. And guess what?! The above mentioned items are served ALL DAY. YESSSS! Even for dinner. That's how good and popular they are. The other 2 breakfast items available all day include The Clinton St. Omelette ($14) and the Huevos Rancheros (Mexican breakfast tortilla, $14). I guess i'll never do lunch or dinner at Clinton Street Bakery. I'm sure that they do some good food as well but nothing can trump breakfast. If you wanna do the other breakfast items, they are served daily from 8am to 4pm. Yes!! too good. I really miss the eggs ben. le sigh.